Shenandoah Townhomes offers two-, three-, and four-bedroom floor plans. Whether you prefer a two-story townhome or a garden style, Shenandoah Townhomes has a floor plan to fit your needs. Every apartment includes an attached garage, a front porch, and a patio. 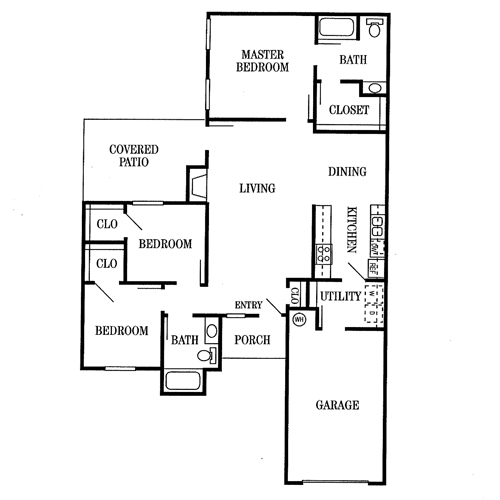 Shenandoah Townhomes also features walk-in closets, large kitchens, and utility rooms. 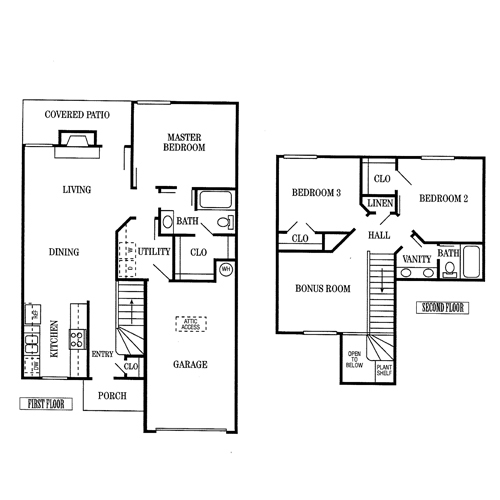 The Vision is a two-bedroom, 2.5-bath townhome with 1,200 square feet of living space. This floor plan has a 276-square-foot garage and is a two-story layout. On the main level, the garage has private entry into the utility room, which connects to the kitchen. The front porch leads into the entryway, which contains a coat closet. The dining room leads out to the covered patio and is open to the galley-style kitchen. The main floor also features a large living room and a guest half bath. The upper level contains the master bedroom with huge walk-in closet and en suite bathroom, and the second bedroom with en suite bathroom. This one-level townhome features three bedrooms and two bathrooms on 1,318 square feet, with a 316-square-foot garage. The pass-through utility room is accessible from the garage and the galley-style kitchen. The master bedroom is at the rear of the apartment and features a huge walk-in closet and en suite bath. The living room includes a fireplace and has access to the covered patio. The two additional bedrooms include walk-in closets and are close to the guest bathroom. A front porch leads into the foyer, which has a coat closet. 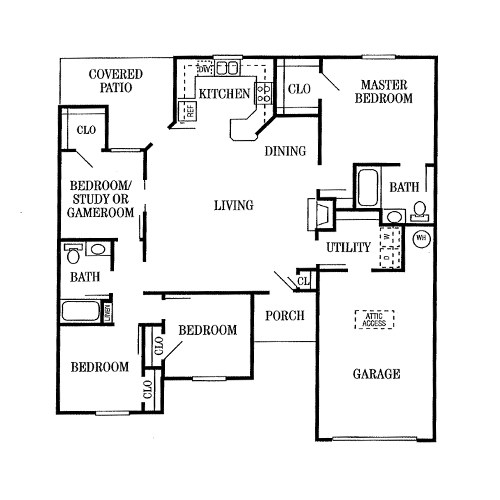 The Remington is a three-bedroom, two bath townhome with a bonus room. This two-story floor plan includes 1,438 square feet of living space with a 300-square-foot garage. The main level contains the front porch, entryway with coat closet, the galley-style kitchen, and an open living and dining area. The garage leads into the utility room. The master is on the main floor and includes a walk-in closet and a Jack-and-Jill style bathroom. The covered patio is located off the living room. The upper level has the two additional bedrooms, bathroom with dressing area and dual vanity, and a huge bonus room with plant shelf. The Sunset offers four bedrooms and two baths on one level. This 1,405-square-foot floor plan includes a 300-square-foot garage, with private entry into the utility room. The G-shaped kitchen is open to the living and dining area. The master suite includes a private bathroom and a walk-in closet. This split floor plan features the three additional bedrooms and another full bath on the opposite side of the living area. This floor plan includes a covered patio and a front porch. The Sunrise is a four-bedroom, two-bath townhome with two stories. 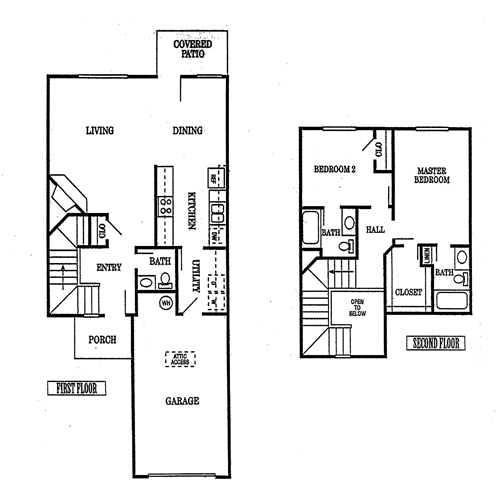 This floor plan has 1,439 square feet of living space and a 258-square-foot garage. The main level features a front porch, foyer with coat closet, galley-style kitchen, open living and dining area, and a covered patio. The master is on the main floor and includes a Jack-and-Jill style bath and a walk-in closet. The upper level contains the three additional bedrooms and the second full bathroom with dual vanity in the dressing area.